NoA have also announced a Nintendo Direct taking place at the same time 9AM PT. You will be able to catch the stream here. Lets hope we get some new game announcements, Yoshi's land anyone? 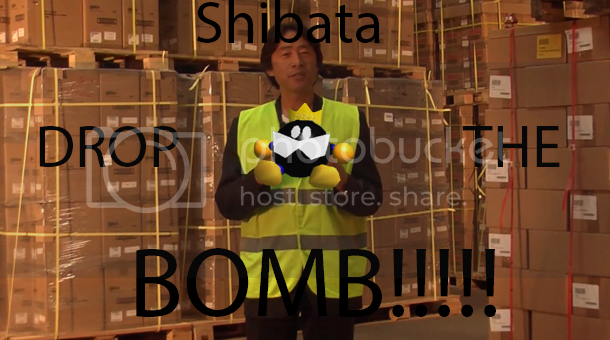 Japan also had a Nintendo Direct. Video and details below, courtesy of GoNintendo. - FIFA 13 12/8, 7665 yen. Mass Effect 3 12/8, 6090 yen. MH3 12/8, 4800 yen. - Ninja Gaiden 3 12/8, 7140 yen. Musou Orochi 2 Hyper 12/8, 7140 yen. #NSMBU 12/8, 5985 yen. - Nintendo Land 12/8, 4935 yen. Tekken Tag Tournament 2 Wii U Ed. 12/8, 6980 yen. - Game & Wario has 16 mini-games, all playable with GamePad only, by up to 5 players. - one Game and Wario game: Pretend to be asleep while your mother is walking by the window or peeks in the door. That is a ridiculously stupid time for anyone in say...Australia hoping to catch some awesome PAL announcements. Hoping a couple of eShop announcements, and dates for Pikmin, Wonderful 101, Lego and Rayman. I think this is going to be good, NA have one going at exactly the same time, usually means a big reveal. 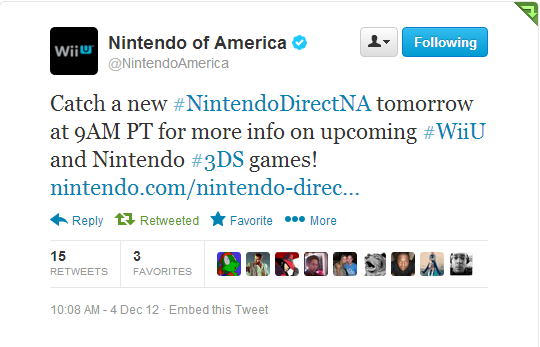 I bet they'll talk about TVii, new games in the eShop(s) right now, a Wii U update is on the way, etc. I'm not anticipating much, but it might be good. Well we haven't had a date on TVii for Europe yet, just a vague mention that it will be sometime in 2013, I would speculate though that neither NoA or NoE wants to let the other have exclusivity over an announcement and that is the reason that both Directs air at the same time. Here's hoping anyway. Maybe Fire Emblem: Awakening? It was hinted at in the E3 coverage, but wasn't "officially" announced until a Nintendo Direct video several weeks later. Anyway, looking forward to the announcements tomorrow! Moderately hyped. I think it would be a good time to reveal another Wii U game. "Tune in here tomorrow at 9AM PT for a new Nintendo Direct! We’ll be taking a fresh look at several announced Wii U and Nintendo 3DS games coming in 2013." Sounds like nothing new is going to be announced. @VofEscaflowne Bill Trinen drop the orange? Huh? That's a little disappointing but not surprising. Figured they'd have a December direct sometime to talk games. This is surprisingly early though. Nice bday present for me! I guess the Direct for future games will be early 2013 which makes sense? Does Nintendo ever announce new games in December? I feel like their logic (sound or not) would be that this would take attention away from the games that you could actually buy during the holidays. Then again, this seems to be mostly about games that won't be releasing in time for Christmas. Hmm. And announcing more games could create more interest in the console itself, and lead to more Christmas sales that way. Either way, "fresh look" to me sounds like no new game announcements. But it'd be nice to see a bit more of what we do know is coming. I was expecting TVii. I was hoping for information about the download bonus system and about games next year, like Pikmin 3 and Wonderful 101. If I was really out-of-touch with reality, confirmation of Yoshi's Land or whatever Retro is doing. Looks like I might get my dreams this time! Lucky! Eh, maybe they'll pin down some actual release dates? "Launch Window" may become "December 20th" or something. -New Mario, Zelda, Metroid, Pokémon, F-Zero, Star Fox game revealed. Anything less will be unacceptable. -New details about TVii, is actually a streaming archive containing every TV show ever released. -Pikmin 3 releasing April 1st, will actually be cruel joke. -New system update for the Wii, will remove Internet and SD card functionality. @Mr_Mustache Ah, that would be nice. Pikmin 3 release date plz! How about something beyond the "launch window"??? Aside from Bayonetta, what has been announced beyond the next wave (Pikmin, Rayman, etc. )?